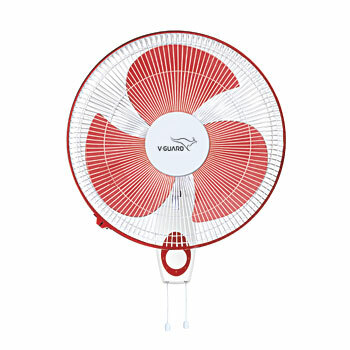 The V-Guard Finesta STD Wall Fan is a nicely designed fan that is a combination of attractive features and performance. 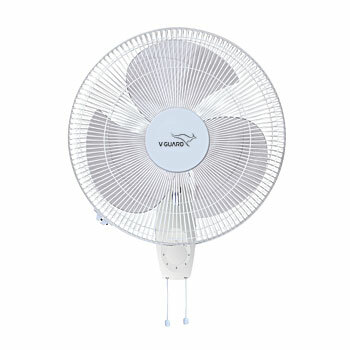 This fan features a strong and sturdy build that also rates high in durability. The V-Guard wall mounted fan has a stylish design along with an eye catching control switch gives that would complement any décor. With its aerodynamically designed superior quality blades for better air delivery, this V-Guard Finesta STD Wall Fan would provide greater and speedy air flow, making it an ideal choice for any home or office. The V-Guard Finesta STD wall fan includes a powerful motor that ensures superb performance for uniform air delivery in any corner of the room. It also has a pull cord for speed regulation and oscillation that in turn ensures smooth running and reduces noise considerably. 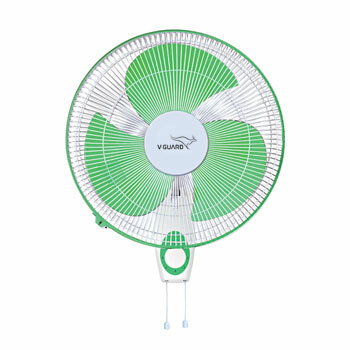 This V-Guard wall fan performs at a speed of 1350 rpm and gives you an air delivery of 65m3/min. The fan offers high performance even at low voltages. It consumes 55 W of power. This low power consumption would help reduce your energy bills while keeping you cool and comfortable.